Best Indoor Dog Potty – a listing of the top indoor dog potty products for 2019. Highest rated by dog owners and trainers. Help prevent your puppy from leaving messes on your carpet. If you’re looking for a great indoor potty solution, the Fresh patch disposable indoor potty may just be the answer for you. First launched in 2013, it was designed to be the ultimate dog box however it was just a concept. The question on everyone’s mind is, how well does it work and the answer is. “it works pretty well”. So here are some helpful tips on how to use the potty effectively. With the Fresh patch disposable dog potty, you get real living grass which is hydroponically grown and is also a natural odor neutralizer. It also instinctively attracts dogs making the potty training process all the more easier. It’s ideal for training puppies as well as aging dogs. Fresh patch is basically a fresh patch of grass in a cardboard box. The specially designed grass goes into a specially designed box which doesn’t leak; however, it is still just some grass in a box. The size of the patch is approximately the size of a large welcome mat and has plenty of room for your small or medium-sized to do their business. When the potty needs to be replaced, all you do is you throw out the old one and replace it with a new one. It is suggested that you replace the doggie toilet once every 1 to 4 weeks. However, this also depends on the size of your dog. Since the boxes are coated with plastic, it will not leak. And the grass is also designed to absorb odors. So it smells like fresh grass when you get it and then remains pretty much odor free until you throw it away. However, if you want to keep it smelling fresher for longer you can also spray some water on it to dilute odors. When you bring a newborn puppy home, you will probably need a training pad to keep them from soiling your floors and carpets. So a training pad is basically a multilayered pee absorbing training tool that helps keep the mess of your floors. It’s especially useful when potty training your puppy. The Rocket & Rex Washable, Reusable, Pet Training, and Puppy Pads comes highly recommended and is designed to save you money. Not only is it more environmentally friendly than the disposable pads, but also much less expensive. If you’re looking for good absorption and odor control, then this is the pad for you. It is especially useful for absorbing and retaining pee and odors, especially for extended indoor stays. It also prevents tracking, and this protects your floors and carpets and also helps to keep them dry. These training pads are pretty much multipurpose and can be used in a variety of situations such as to transport your dog or puppy, protect your furniture and rugs from dirt and, it can also be used to line playpens and kennels. It can be placed under litter boxes and great for children who bed wet too. It also comes in extremely handy when taking care of aging or sick dogs. This specific training pad from Rocket and Rex has four superabsorbent layers. One of those layers is a water backing, and it will continue to last irrespective of how many times you wash it. Since it is designed in the US it also has a 100% satisfaction guarantee. Are you looking for an environmentally friendly dog party for your best friend? If you answered yes to that question, then you have come to the right place. The DoggieLawn Disposable Dog Potty is entirely disposable, so it leaves behind no mess, no odor and requires no cleaning except for the removing of the pet solids. This is one of the best eco-friendly alternatives to using plastic potty pads. Since it is made from real grass, it also helps to absorb odors and liquids much like a real grass on your lawn does. It also Instinctively attracts your dog’s, and all you need to do once your package arrives is simply take the lid of the cardboard box and place it in your desired location. It will automatically attract your puppy or dog. In cases where your dog doesn’t instinctively take to it, training assistance is provided by DoggieLawn. Because this is real grass, some light watering will be needed. Some factors that will affect how long it lasts includes the frequency at which it is used and the weather as well. It is suitable for dogs, cats, and rabbits too. Dogs that are accustomed to the indoor living will especially take to doggie lawn and find that it is perfect for playtime. If you want your dog to keep away from mud, and you’re looking for a good potty solution that is also cost-effective and low on maintenance, then MTBRO Artificial Grass Rug, Perfect Dog Grass Mat may just be what you’re looking for. This product eliminates the hassle of mowing, fertilizing, watering and weeding your lawn. Not only is it high quality but it’s made of UV resistant PE & PP yams and is also designed to last you a lifetime. It has a natural and real appearance which makes it beautiful and it’s also soft and comfortable for pets and children to play on. 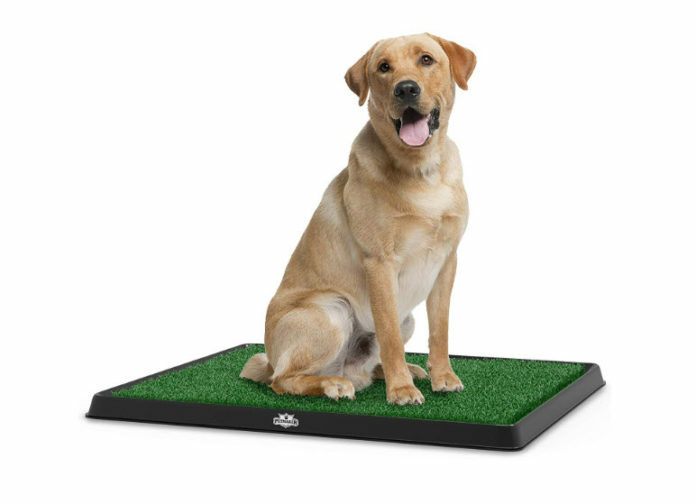 It can be installed at any play area for pets, in your yard, on your patio, in the garden area, balcony, roof, swimming pool area or your pets potty training area as well. It will also make a wonderful doormat. The high-quality, anti-UV and antiaging material is suitable for both hot and cold weather conditions. Since it is eco-friendly, it does not have a particular smell and is also non-toxic. It looks and feels very much like real grass. However, since it is not, it won’t require any of the maintenance that natural grass needs. It has a coated rubber backing that has drainage holes so this makes it easy to wash. So say goodbye to mud for good. If you are a pet owner, you know exactly how challenging it can be to train some puppies. However, as the owner, you know best and this is why you should do whatever it takes to give your puppy the best chance at success made comes to potty training. The Amazon basics potty pads is reliable and convenient so you can train your puppy most effectively. It also works to assist a sick or aging dog and make dogs more comfortable during travel. Alternatively, it’s a wonderful tool for dogs who don’t have access to the outdoors on a regular or timely basis. It contains a five-layer leakproof design, and ultimately this helps to lock in the wetness while the anti-streaming top layer is quick drying. These added layers also reduce odor and prevent tracking. The surge layer helps the liquid flow in the right direction, and the sponge-like core gives maximum absorption and converts the liquid into a gel substance. If you found that potty training a puppy is tedious, this pad has a built-in attractant for faster results. Dogs and puppies will be drawn to the pad when nature calls allowing your puppy to be trained quicker and more effectively. The AmazonBasics Pet Training and Puppy Pads is suitable for small dogs and puppies and unsuitable for larger dogs. If you’re looking for a wonderful and innovative potty training solution for your dog, then you should try KOOLTAIL Washable Pee Pads for Dogs. The solution is both convenient and low on maintenance as the pee pads are machine washable. It is also extremely cost-effective since it is reusable. It’s convenient to use daily since they are unscented yet odor free. You don’t need to iron them, dry or bleach them. These pee pads are also super absorbent and have a high-density inner layer with a breathable waterproof PUL. This way you can be assured of all night dry protection. It’s also perfect for puppy whelping, and can be used to assist aging dogs, sick dogs, protect furniture and make it up more comfortable for your dog when traveling. This pee pad will also allow you to feel more comfortable when you leave your dog alone at home. If you are a pet owner, then house training your pet is a part of being a responsible pet owner. However, training each dog is unique to the dog’s personality, intelligence and willingness to obey commands. So for some owners, there may be certain challenges, obstacles, and headaches along the way. However, one way in which you can aim to overcome these challenges is to invest in a dog potty product. The are various dog toilet options available, and it can be extremely beneficial in the potty training process as well as assist aging dogs who need a little in-home assistance. Some of the most popular dog potty training products include natural grass patches, peep pads, training pads, and disposable pee pads. There are various types off potty training products on the market. One of the most popular is pee pads. These are basically a soft cloth that is slightly padded and extremely absorbent. It is also scented and made to absorb odors. Some of them can be washed and reused while others are disposable. Artificial grass patches are another type of popular dog potty that usually comes with a removable tray at the bottom, and it is made to look like natural grass. This ultimately encourages your dog to go to the bathroom and can be used over and over since it is artificial grass. Real grass Indoor potties are on the expensive side and need to be replaced every one to four weeks. However, if you enjoy the fact that real grass neutralizes odors, is absorbent and don’t mind spending an average of one dollar a day for your dogs potty requirements, then this is a great option for you. For dogs that like to do their business in the sand, a litter box option is ideal. They are available in several sizes, styles, and colors but are usually recommended for smaller dog breeds only. The grate style dog potty is a low pan that has a grate which can be detached and fits over the pan. So all you do is simply detach the grate and dumb over the waste and rinse off both parts of the potty to clean it. It can be used over and over again and is another popular choice. Dog parties can start from as low as three dollars and go up to $150 depending on the type, style and complexity of the party itself.